In 1953, the movement that led to the creation of the state of Andhra Pradesh. This act was consistent with Gandhi's wishes and with established Congress policy, yet it grated with the Prime Minister of the day. He could see that the formation of Andhra would lead to similar demands by other linguistic groups. "You will observe," wrote Jawaharlal Nehru archly to a Cabinet colleague, "that we have disturbed the hornet's nest and I believe most of us are likely to be badly stung." The success of the Andhras did embolden other communities to come out stinging. There was now a major campaign for Samyukta or Greater Karnataka, aiming to unite Kannada speakers spread across the states of Madras, Mysore and Hyderabad. The Malayalis wanted a province of their own, bringing together the erstwhile princely states of Cochin and Travancore with Malabar. There was also a Mahagujarat movement. But, in terms of mass base and popular appeal, the most significant of the post-Andhra linguistic struggles was that which spoke for Samyukta Maharashtra. After Andhra, the Government of India set up a States Reorganisation Committee (SRC). Its report, submitted in 1955, pretty much conceded that India would be reorganised according to linguistic provinces. But some ticklish questions remained. The most serious was the future of India's most prosperous city, Bombay. Would it go to Maharashtra, since it had more Marathi speakers than speakers of other languages, and since the areas contiguous to it would anyway form part of the state? Or would it go to Gujarat, since the Gujaratis had invested so heavily in its development? Or, since there were many other linguistic groups in Bombay, would it be constituted as some kind of autonomous, multicultural city-state? The question of Bombay's future came up for discussion in the Lok Sabha on November 15, 1955. Strongly pushing the city-state alternative was the Marathi-speaking M.P. from Bombay, S.K. Patil. His city, said Patil, had a "cosmopolitan population in every respect; it had been built upon the labour of everybody". It was, he continued, cosmopolitan in theory as well as in practice: here "everybody thinks in terms of common citizenship". This is what Patil said in Parliament, and he later expanded on the theme in a newspaper interview. The prospective city-state of Bombay, he told the paper, would "be a miniature India run on international standards ... (A) melting pot which will evolve a glorious new civilisation ... And it is an extraordinary coincidence that the population of the city should be exactly one per cent of the population of the whole country. This one per cent drawn from all parts of the country will set the pace for other states in the practice of secularism and mutual understanding." Patil asked the Maharashtrians to give up their claim on Bombay in the spirit of compromise. The plea was rejected in ringing tones by the M.P. from Pune, N.V. Gadgil. Speaking immediately after Patil in the Lok Sabha, Gadgil insisted that while he was in favour of compromise, "there is a limit. That limit is, nobody can compromise one's self-respect, no woman can compromise her chastity and no country its freedom". The reports of protest meetings should make it clear "that anything short of Samyukta Maharashtra with the city of Bombay as capital will not be acceptable". If these sentiments went unheeded, warned Gadgil, then the future of Bombay would be decided on the streets of Bombay. The Maharashtrians were being urged to accept the loss of Bombay in the name of national unity. Gadgil protested against this unsubtle attempt at blackmail. The last 150 years, he said, had seen Maharashtrians contributing selflessly to the growth of national feeling. Marathi speakers founded the first schools and universities, and helped found the Indian National Congress. The Mahrattas were "the pioneers of violent action" against the British. Later, in the early 20th Century, when the Congress party languished, "who was it that brought in new life? Who propounded the new tenets and new philosophy? It was Lokmanya Tilak. In the Home Rule movement he led and in the 1920 movement we were behind none and ahead of many provinces ... I will merely quote the certificate given to us by no less a person than Mahatma Gandhi that Maharashtra is the beehieve of (national) workers". Even now, in independent India, it was a Maharashtrian, Vinoba Bhave, who was "carrying the flag of Gandhian philosophy and spreading his message from place to place". In the case of Bombay, the Maharashtrians were being lectured on the need to "work for the unity and safety and good of the country". But, said the Pune M.P. bitterly, all these years "we have done nothing else". His Lok Sabha was altogether a wonderful and moving peroration — and the last line was the best: "To ask us to serve the nation is to ask chandan (sandalwood) to be fragrant." Note that both S.K. Patil and V.N. Gadgil belonged to the same party, the Congress. The party's High Command finally decided to recommend to the Government of India that Bombay be made a city-state. Regional sentiments were disregarded, sparking widespread protests. In the 1957 elections the Congress was routed by an opposition front uniting under the banner of Samyukta Maharashtra. The anger spilled over into the streets. In 1960, the Government of India conceded the right of the Maharashtrians over Bombay. To recall the debate between Patil and Gadgil is to remember a time when Indian parliamentarians were both independent-minded and intelligent. Patil's case, for retaining Bombay's cosmopolitan character, was made with logic and eloquence. But Gadgil's case, for the centrality of the city to Maharashtrian identity, was compelling as well. Here were politicians from Maharashtra who could argue on the basis of principle, and believe in what they said, too. In some ways one can still hear the echoes of that old Lok Sabha debate. For, tragically, what was to N.V. Gadgil a matter or legitimate cultural pride has degenerated, under a different kind of Maharashtrian leadership, into an insular parochialism. The battle for Bombay continues. On the one side are those who see it as a truly cosmopolitan city, which can still "set the pace for other states in the practice of secularism and mutual understanding". On the other side are the visceral chauvinists of Bal Thackeray's Shiv Sena. 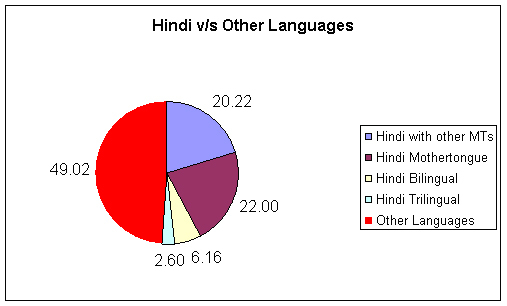 In the case of Andhra Pradesh, the minority consists of Urdu speakers centered in the state's capital, Hyderabad, where nearly 40 percent (some 1.7 million people in 1991) of the population speak that language. Linguistic affinity did not form a firm basis for unity between the two regions from which the state had been formed because they were separated by cultural and economic differences. Although there were riots in the late 1960s and early 1970s in support of the formation of two separate states, the separation did not occur. The violence that broke out in the state of Assam in the early 1980s reflected the complexities of linguistic and ethnic politics in South Asia. The state has a significant number of Bengali-speaking Muslims -- immigrants and their descendants who began settling the region in the late nineteenth and early twentieth centuries. The Muslims came in response to a British-initiated colonization plan to bring under cultivation land left fallow by the Assamese. By the 1931 census, the Assamese not only had lost a hefty portion of their land but also had become a disadvantaged minority in their traditional homeland. They represented less than 33 percent of the total population of Assam, and the Muslim immigrants (who accounted for roughly 25 percent of the population) dominated commerce and the government bureaucracy. Assamese-Bengali rioting started in 1950, and in the 1951 census many Bengalis listed Assamese as their native tongue in an effort to placate the Assamese. Further immigration of Bengali speakers after the formation of Bangladesh in 1971 and a resurgence of pro-Bengali feeling among earlier immigrants and their descendants reawakened Assamese fears of being outnumbered. Renewed violence in the early and mid-1980s was sufficiently serious for the central government to avoid holding general elections in Assam during December 1984. In the compound of Amritsar's Golden Temple, holy of holies to India's 6,000,000 Sikhs, long lines of tall, bearded and turbaned Sikh men and slender Sikh women passed slowly by a small wooden hut. When they reached the hut, each Sikh dropped a coin or a bill in an offering box, then peered through a tiny glass window. Inside, on a hard mattress, lay Sant Fateh Singh, 50-year-old Sikh holy man. While doctors and disciples stood anxious watch, Sant Fateh Singh was carrying on a hunger strike. Its aim: to compel the Indian government to create a separate linguistic state in the Punjab, traditional home of the Sikhs. In May, 1960 the Indian government arrested the Sikhs' wily political leader, Master Tara Singh, for advocating a Sikh march on New Delhi to demand statehood. Before disappearing behind prison walls, Tara Singh designated Sant Fateh Singh as his successor. For weeks stretching into months, young Sikhs, shouting "Punjabi Suba Zindabad" (Long live Punjabi state), had poured out of the Golden Temple at Amritsar and the Sikh temple at New Delhi—into the waiting arms of tough Indian police, who hustled them off to prison. At one time India's overburdened detention camps held 20,000 Sikhs. About the last week of December,1960 Sant Fateh Singh decided that even more effort was required to force a grant of separate statehood. A husky 260-pounder, he announced that he was embarking on a "fast unto death," would take water but no food of any kind until New Delhi gave in. By last week the holy man was down to 243 lbs., and daily health bulletins, issued with Jim Hagerty-like detail, were emphasizing the presence of ketones in the urine, indicating imminent uremic poisoning. For India's Prime Minister Jawaharlal Nehru, keeping in anxious touch with developments while making a tour of Uttar Pradesh, the fast—and the whole Sikh effort—presented a number of galling ironies. In the first place, fasting as a political weapon was developed by Nehru's nationalist mentor, Mahatma Gandhi, but is now regarded by New Delhi as in bad taste. Secondly, to justify keeping Master Tara Singh in jail without proof of crime, Nehru a month ago had to insist on a further extension of the same Preventive-Detention Act passed originally under British rule to allow the imprisonment of Gandhi, Nehru himself and other Indian freedom fighters. After the bill was rammed through by a 165-10-33 vote, loud cries of "Shame! Shame!" reverberated in the Lower House chamber. Finally, the Sikh demand for a separate state is an embarrassing end result of Nehru's own mistakes. After the Prime Minister backed down spring and allowed the division of Bombay State between the Marathi and Gujarati language groups, the Punjabi-speaking Sikhs became the only one of India's 14 major constitutionally recognized linguistic groups without a separate state. Nehru and the reigning Congress Party contend that the Sikhs are less a linguistic entity than a religious community.